It was almost Cinderella stories all-round as the final of the day of the Partypoker Millions Online came to an end on December 5. With each of the 29 players in the $5,300 event guaranteed $65,505, the final session saw chips fly from the start. Leading the way in the record-breaking online MTT was wheatforsheep. Holding over 200 million chips more than his closest rival, the Mexico-based player looked to be in control during the early exchanges. However, as the field thinned, it was Pim de Goede who started to take control. Playing under the alias ForMatherRussia, the Dutchman seized every opportunity and found himself among the top stacks with just ten players remaining. While de Goede was trying his best to win Partypoker Millions Online in style, all eyes were on Slovenia’s Scarmak3r. Despite being one of the least experienced players in the field, the online grinder was just a few moves away from writing a Moneymaker-esque story. Unlike those that paid the full buy-in, Scarmak3r qualified via a $5 feeder. Working his way through the satellite system, the Slovenian eventually found himself among the 4,367 runners bidding for the richest prizepool in online poker history. As the final table of eight beckoned, a timely double up with A♦J♦ against GangbaaangBob gave the qualifier a renewed sense of confidence. In the end, however, it was de Goede who ended the dream. After moving all-in with pocket deuces, Scarmak3r needed help against the Dutch pro’s sixes. That help never came as the board ran out 10♣4♠5♥9♠4♣. Despite finishing third, Scarmak3r banked $1,364,688 while his performance will serve as a source of inspiration to aspiring pros around the world. Heading into the final showdown, de Goede and Manuel Ruivo were almost even in chips. Knowing that a mistake either way would cost them over $600,000, the pair agreed to a chop based on chip counts. With Ruivo holding the larger stack, he banked the top prize and etched his name in the history books as the latest Partypoker Millions Online winner. For Partypoker, the event will go down as a success. Following a slow start, many believed the $20 million guarantee was a step too far. 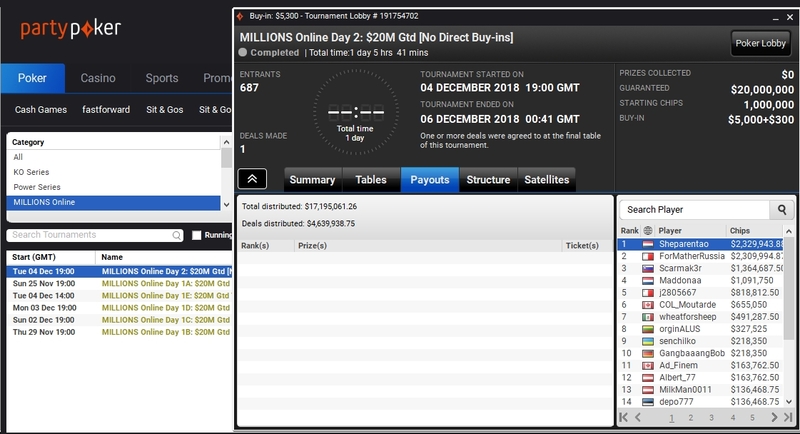 However, a late surge tipped the balance, pushing the prizepool beyond the $21 million mark to make it the most lucrative online MTT in history.